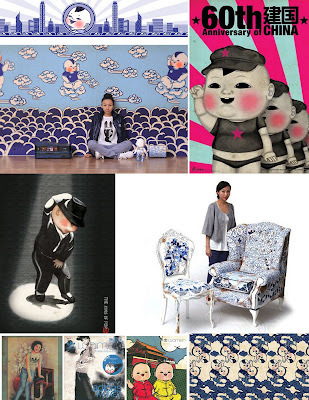 You know Dorophy Tang from her collaborations with Nikon, Adidas Lomography (...) This talented Hong-Kong based designer is known mixing traditionnal Chinese style illustratin with modern theme. Tell us a little bit about yourself, Who is Dorophy Tang? I'm a product designer and also an illustrator, who was born and raised in Hong Kong. Growing up in an East-meets-West cultural background, I was brought up to value these two extreme cultural universes. I've built my passion on the mixing & matching of very different cultural elements in my arts. When and how did you get involved with design and visual creativity? I obtained a Bachelor in Design in 2007. After graduation, I went into a product design At the period of time, I needed to meet every criteria from the clients. Eventually, I used my spare time to do my illustration, and completed my design of my favorite characters the Shopping Babies. The serial illustrations of Shopping Babies then started being published in a trendy cultural magazine, Milk Magazine (China version). In other words, the babies were known in China from the very beginning. Your work is obviously influenced by traditional Chinese artistry, who are some the artists that have influenced your work? I love posters of the 70's in China. The style of the propaganda poster always tends to give the most positive message. Chinese New Year prints (Ninhua in Chinese) are my inspiration too. I love seeing chubby babies on the posters. I admire the work Liu, Yue and Yue Min Jun, who are well-known contemporary artists from China. As for designers, Vivienne Tam inspired me a lot for her usage of very traditional and yet Chinese style in her fashion collection. Some of you collaborations include work with Adidas, Lomography, are your working on any projects? Last month, I collaborated with the public art exhibition with Kappa with Chinese Ink painting style. I'm doing something for the Chinese new year in collaboration with a famous Hong Kong shopping mall called Harbour City, this is the second year I'm designing the red packets sets for them. This time the design will be something more extraordinary. Growing up I always wanted to be a painter.